You know how Marvel Studios tries to infuse a little bit of a different genre into each MCU film? Captain America: Winter Soldier is a conspiracy thriller, Ant-Man is a heist movie, Spider-Man: Homecoming is a coming-of-age teen comedy, etc? For anyone wondering what genre the upcoming Black Panther falls into, director Ryan Coogler has revealed the answer in the latest issue of Total Film: James Bond-style espionage action. 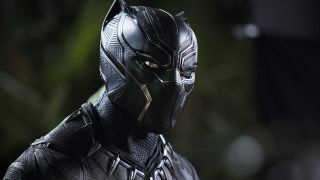 "When I first started talking to Marvel, one thing they were interested in was for Panther to be their version of James Bond, which I thought was incredibly interesting and exciting," Coogler said. "It was a really outside-of-the-box way to look at T'Challa. There are some Bond films that I really, really like, and it gave me the opportunity to go watch some other ones." Subscribe: Pick up a subscription to Total Film magazine and get stories on Black Panther, The Avengers, and more delivered straight to you - digitally or physically! That might sound a bit strange, given that the character is the leader of a highly-advanced nation and was running around in broad daylight throughout Captain America: Civil War. But the Black Panther solo movie will show a different side of Wakanda's king, and stress the element of secrecy. The nation of Wakanda hides its bordering-on-sci-fi technology from the world, and T'Challa approaches his foes a bit less directly this time around. Think about the car chase glimpsed in trailers: doesn't that seem like something a Bond movie would feature? Of course, Bond is never truly alone on his missions. He's got friends like Q to provide him with gadgets and Moneypenny to reign in his more reckless behavior. T'Challa also has those things, courtesy of his sister, princess Shuri. When Total Film asked Letitia Wright, who plays Shuri, if she thought the comparison fit, she agreed. "Yeah, why not? She’s T’Challa’s Q. She's by his side with the technology he needs. The way she helps him is really cool," Wright said. "I hope Shuri can help people. Maybe you’re in school right now, and super smart and super intelligent, and people may be saying, 'You're a geek,' or whatever, making them feel bad. Maybe they can watch this film and be like, 'Man! Being smart or a scientist or super great at math is not a bad thing at all.'" Want to learn more before Black Panther hits theaters on February 16? Pick up a copy of Total Film magazine from your local bookstore or news stand, or get a subscription deal to stay on top of all the latest film and TV news.